George has a home! 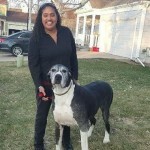 - Rocky Mountain Great Dane Rescue, Inc.
George has a home with Francesca and her teenage daughter in Denver, CO. Francesca has always had an affinity for Giant Breed Dogs. Her last dog was a mastiff who sadly passed away. Since then, Francesca has had several fosters go through her home; a few Danes and a Mastiff. After much time giving back and leaving her door open to help other dogs find their forever home, she felt it was time to find her own match. The day that she got to meet George she simply fell in love with his sweet nature and disposition, not to mention her soft spot for seniors. Way to go George!